Lil’ Chit-Chat Inc. provides the highest quality therapy services with proven results. Our precious children deserve the highest caliber services available. At Lil’ Chit-Chat Inc,helping children with speech-language development begins as young as 18 months of age. Our therapy is play-based with an emphasis on parent training. Communication is the key to academic success. Our therapists provide your child with the tools needed to develop vocabulary, enhance grammar, and improve listening comprehension. We provide parents with a framework which allows their children to flourish and thrive. 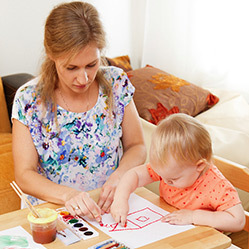 Parents are educated in therapies related to their child’s needs, enabling the implementation of strategies at home.